If there is one thing Hollywood believes with absolute certainty, it is that sudden disability of any kind automatically and completely ennobles someone. Gone are their abrasive edges, their psychological ticks and their flawed humanity, replaced by an inspirational outlook and persona that makes Mother Theresa look like a serial killer on a drugs and alcohol bender. It’s all garbage of course; being struck down, as the protagonist, high-powered car industry dynamo Alain Wapler (Fabrice Luchini) is in Hervé Mimran’s Man in a Hurry (Un homme pressé), by something like a stroke does not immediately transform you into the Dalai Lama, Girl Guide and Pollyanna combined. 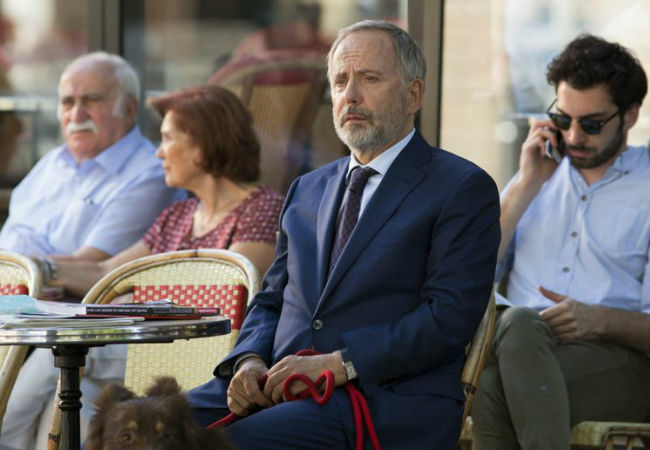 With a script that is both heartfelt and cleverly-nuanced, eschewing the usual mawkish saccharine-ness of its Hollywood counterparts, Man in a Hurry shows what it’s really like when your high-octane, full speed ahead life is brought to a sudden, shuddering halt. To be fair, that doesn’t mean it’s some kind of searing documentary-like drama that lays the horrors of stroke enfeeblement bare; it is after all still a dramedy designed to tug at the heartstrings. Even so, Alain, who is the no holds barred, sacrifice-family-for-career CEO of a major French car company who are pinning everything on the launch of a revolutionary new electric car, the LX2, is portrayed as a man who has to deal with all kinds of ramifications from his stroke, many of them as far from inspirational as you can imagine. All of a sudden, for instance, he loses his ability to speak coherently. This is a big deal; not only is he known for mowing down ideas, people and situations with a few rapid-fire comments which hold no place for sentiment or human sensibilities, including those of his own daughter Julia (Rebecca Marder), he is also a renowned business leader, a man who lectures at colleges and symposiums, and smoothly-formidable media operator who is as a famous as he is talented in the art of crushing his opposition. All of this ends one typically-exhaustive day when an early morning stroke, which Alain shrugs off with typical bullheaded tenacity, becomes a second strike, his life only saved by loyal and caring chauffeur, one of the few people who holds any kind of affection for a man who is, by any estimation, not that likable. Like anyone would be, Alain does not accept his new place in life with any kind of grace or good humour. He is, after all, used to getting what he wants when he wants, brooking no wavering or opposition, and so when the consequences of his stroke refuse to yield to his famously iron will, not through want of trying on his part, he reacts as many people in his position would with anger, characteristically-gruff comments, and irascible impatience, directed usually at his nurse Vincent (Igor Gotesman) and his speech therapist Jeanne (Leïla Bekhti). He essentially demands that Jeanne, who is struggling with her own issues as an adopted child searching for her birth mother (with her adoptive parents blessing), fix him and fix him for a deadline, which is a major car show in Geneva in a few weeks time. She can’t, of course, especially when against doctor’s orders, he checks himself out of hospital, his speech almost-comically peppered with mispronunciations of the right words, and tries to resume life as normal. That isn’t possible but it takes some time, and some sobering life developments, for Alain to come to grips with the fact that he has to adapt to a new normal that will bear little to no resemblance to his old, pre-stroke life. 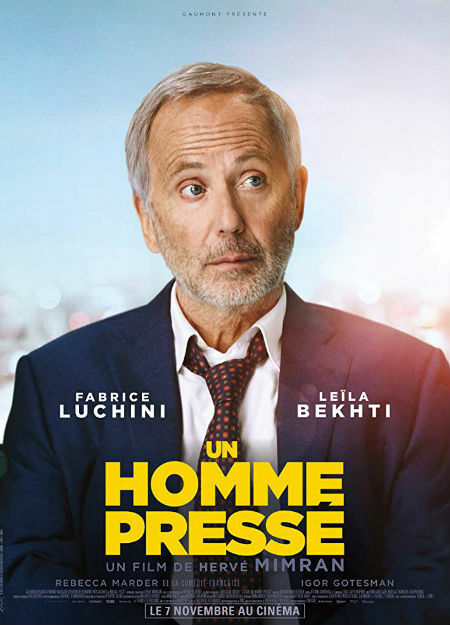 Watching him grapple with these sobering realisation is heart wrenching and graphically real, made all the more evocative by Luchini’s extraordinarily-expressive performance which makes much of his inability to say a great deal while saying very little. Once his bluffing and cantankerous, pointless bargaining with fate and everyone in his life is spent, what is left is a man stripped of smooth speech, employment and a way forward, all of which is brought into vivid, achingly-sad relief, with some moments of humour (his replacement of the right words with their rhyming counterparts is funny to a point) leavening a very honest portrayal. It’s Alain’s journey out of this valley, this existential abyss that informs the final third act of a film which yes, does slip into some slightly-mawkish moments of sentimentality and occasional flirting with American-style inspirationalism but which mostly stays true to its depiction of a life ruined and then rebuilt, piece by agonising piece. Also key to the film’s emotional impact is Jeanne, who is given substantial time to have her life story told, giving her sufficient well-roundedness that the friendship that develops between her and Alain makes perfect sense, as does the way he repays her willingness to go and above beyond in her treatment of his condition. By placing a full-realised Jeanne into Alain’s orbit, and not skimping on the exact nature of her life at the time, Man in a Hurry is a given an appealing richness and emotional veracity that many films of this ilk lack. 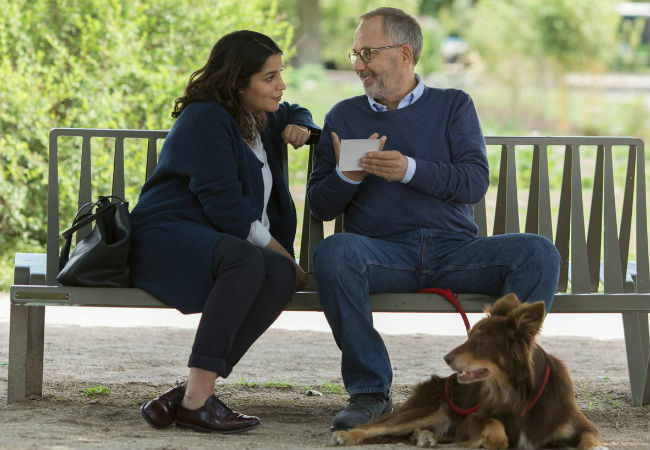 They feel like two very real people, forced together by unusual circumstances in each of their lives, both at turning points of a very different nature, who must reach accommodation with each other to make the new normals they are confronted with work. Adding levity to all this existential toing-and-froing is Vincent, a nurse with a warmly-irreverent attitude who is smitten with Jeanne and who provides Alain with unconditional friendship that rests not only on what Alain did, which is no longer a reality for him and thus useless as a defining personal characteristic, but who he is, a key element in his patient’s transition from corporate superstar to a man back in touch with family, friends and life. It’s all hyper real to some degree, as is the nature of these kinds of dramedies, but the important thing here is that it does feel real, a moving portrayal of life after fate has stepped in with jackboots and a pick axe, and the resulting pieces aren’t required to be put back together so much as recut and reassembled from the start, in a way that either makes or breaks the person confronted with this significant life change. That Alain does come out on top will not surprise you but how he gets there is a genuinely-pleasurable, touching experience that makes you reassess how you would handle the same sort of transformative situation.